There's something magical about falling flakes of snow that has the ability to captivate both those young and old. Whether it's your first snowfall or your 50th, you can't help but be mesmerized by the beauty of falling snow. Today we celebrate snow and say "Let it snow, let it snow, let it snow!" Let's see those snowflakes and snowmen stamps! Mesmerize us with snowy fun flock hills and glistening trees covered in snow. Anything with snow goes in this sketch and product challenge! Sketch and Product Challenge using anything that reminds you of snow! Snowflakes, snowmen, snow covered trees...anything! Participants should post a comment and a link to their card on Mandy's blog, all entries must be submitted by Sunday, December 14th, at midnight for a chance to win your choice of glitter! And my sample. I went with non-traditional snowflake colors. 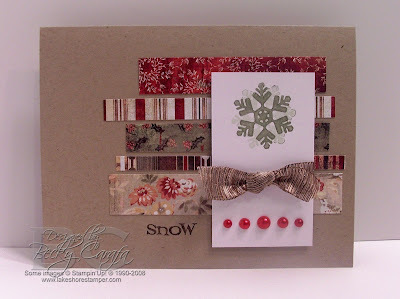 Basically, I wanted to use the Wassail paper, so I made the snowflake go with it, lol! I cut different strips of Wassail and attached them to a kraft card base. I stamped the snowflake, rotated my stamp and stamped again without reinking, then went over the first snowflake with Angel Wings Shimmerz. I tied a knot and added some red pearls. Can I just say I love all the Kaisercraft pearls and rhinestones? They are fantastic and you get a lot of them in one little package at a great price! I have linked the products used here in the recipe below. Make sure you check out the amazing designs of the rest of the team! another beauty, Becky. this is just soooo pretty. That paper is gorgeous! I love this card. Gorgeous DPs, love the card!!! LOOOOOOVVVVEEEEE! So simple, but I absolutely love the layout!! Wow! I love it! Those colors are just so warm and beautiful and you worked in the snow element too! Gorgeousness! I love your take on the sketch Becky! It is really eye catching! This is really cute!! I love the vintage feel to the papers you chose!! How beautiful!! what a neat card. simple and so pretty.